In a contest where the challenge is arduous, you can easily identify the gifted and dedicated. 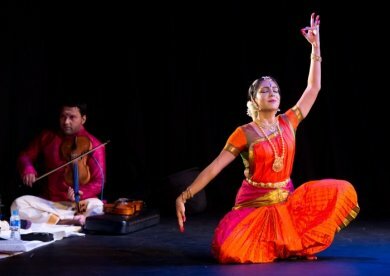 In today’s context, when you take an ancient Eastern art form like Bharatanatyam and deliver it amidst the challenges of life in a modern global environment, particularly against a backdrop of rising audience expectations, the beauty of the art and the expertise of the performer are churned out like butter from milk. Srinidhi Raghavan’s performance at the Bharatiya Vidya Bhavan in West London was a testament to the skill and dedication of a brilliant and impassioned artiste. The performance was a kaleidoscope of interwoven factors. The use of Hindu mythological stories in Bharatanatyam is common. That said, on this occasion, the theme was well thought out and the emotions of the characters were carefully researched. While every composition was a rare gem, the two main pieces on Dasaratha and Kunti were particularly impressive as they were original compositions and reflected the rigorous research that had gone into the depths of ancient Hindu texts to bring to life timeless concepts. Many may have enjoyed the overall experience of the music and movement but any person seeking more would have found a number of spiritual truths embodied within the themes. We all hear whispers, within and without, and more often than not, we act on them without giving thought to the consequences. Srinidhi depicted how sometimes due to pride (as in Dasaratha), or sometimes in seeking out adventure and trying the unknown (as in Kunti) we act impulsively on the voices we hear in our minds. 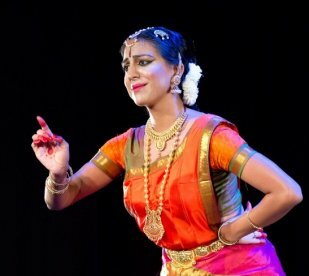 The anguish at the consequences of such actions was clearly conveyed both by the dancer’s moving abhinaya and the soulful rendering of Thilagasakthy, the vocalist, whose music flowed beautifully with the corresponding emotions of the dancer. Srinidhi Raghavan’s fluid and precise nritta was skilfully complemented by intense abhinaya, a delicate mudra here, a subtle glance there. The depiction of the mighty Dasaratha as a guilt-ridden and broken man left the audience stunned. Similarly, watching a young beguiling Kunti battle her emotions both as a young mother and then as an older widow, was moving. Nandanar was a picture of devotion, while the flirtatious gopi in the padam “Thottu thottu pesa varaan” was the definition of a young and lovelorn girl. The sequence of pieces and the portrayal of each character were brilliant. The choreography was a good blend of traditional steps and innovative execution. The music was soulful; we could virtually sense the emotion of each character. Credit goes to Usha Raghavan for composing superb music and also masterly conducting the orchestra. Thilagasakthy was enticing with her voice as was Jalatharan on the violin. Prathap Ramachandra, the mridangist, was a great asset to the orchestra, especially as his jathis and special effects added such magic to the piece on Dasaratha. Jasdeep Singh Degun on the sitar and Janan on the tabla brilliantly added North Indian flavour to each item. The use of the sitar was particularly interesting to note as it blended well with the narration that preceded each story. In short, in Voices, Srinidhi Raghavan’s technique was flawless, her emotions were raw and captivating and her delivery was honest and moving. Voices is indeed a compelling watch. Malar Linkeshwaran is a dancer and connoisseur of South Indian classical music and dance. She learned under teachers in Sri Lanka, India and UK, including the late Guru Adyar Lakshman (India), Pushkala Gopal and Unnikrishnan (UK).